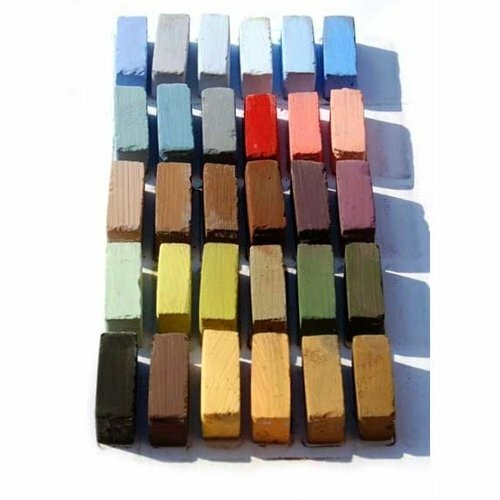 Terry Ludwig began experimenting with formulas for making his own pastels in 1995. He created a vast array of pastels that were uniformly soft across all densities of hue. Best of all his pastels are shaped like the old Grumbacher sticks they are square in shape. Terry Ludwig Pastels are approximately 1-1/2" x 1/2" x 1/2". Because each pastel is hand crafted size and shape may vary slightly. Crafting each pastel with a broad range of pigments by hand with minimal natural binders renders highly concentrated velvety soft pastels. The square shape delivers thick broad strokes and thin precise lines where necessary. The Pastel Journal describes Terry Ludwig Pastels as "buttery" and "velvety". These sticks feel comfortable in your hand they are just the right size and the square shape prevents the stick from rolling off your table.